Some of those paintings fit nicely together in pairs, so clearly I was trying to escape the small format. Around then, I started experimenting with different sizes and surfaces, but the paintings could still fit easily inside a suitcase, as art supplies and finished works needed to be moved around. Going bigger just seemed to give me more space for water, though! Although my subject is outdoors, this is not a plein air series – as in I don’t paint them outside. I love to go out walking with my camera, and take details of rock formations – big slabs, bending and twisting layers, abrupt colour changes, intrusions – all fascinating glimpses of an ancient past. By losing the water (I had my full range of paints again!) 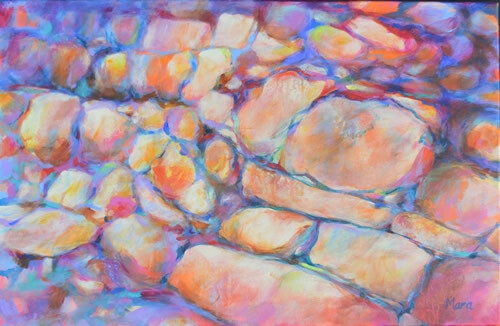 and treating the stone blocks as an abstract pattern – I could play with colours and shapes. By this point in the series, the photographs and finished paintings are not always recognisably the same view! The series is growing in other ways too. 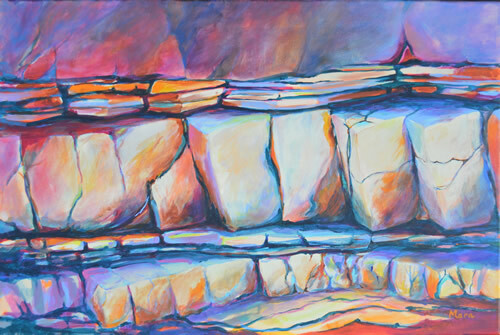 Rocks #15 is a 20″x30″ canvas, which is a nice comfortable size, and I enjoy having the extra space to explore the blocks of stone and the patterns. Going the other direction, I also have a few little 5″x5″ guys that zoom in on some detail that attracts me. In some ways these are harder, as the composition really has to have a clean, simple structure. Maybe some of these will one day become bigger versions, who knows? 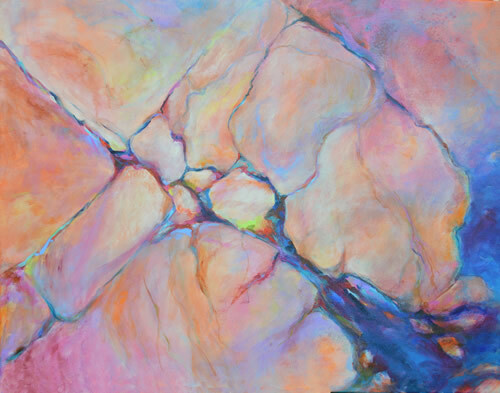 The power of painting in a series is that you get to explore your subject and become familiar. 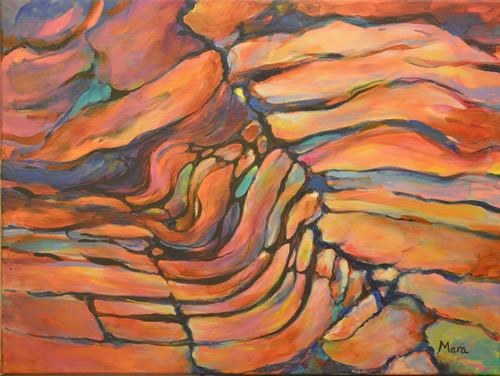 Rocks #18 is layers of rock that have been compressed and ended up broken and twisted, but if I got it right, you shouldn’t care what it actually is, only (hopefully) find the painting attractive and interesting in itself! More exploration of different types of layers in Rocks #19. I love the variation of the multiple thin strips against the one thick layer – all cracked by the weight of more stone on top. Each layer of limestone must represent some buildup of ancient surface – under a river or sea somewhere? A softer representation in Rocks #21 with a less rigid lineup and mixed block sizes. It’s all part of the same fascinating geological formation with multiple layers and time passing. Some of the colour differences between neighbouring rocks can be quite striking. 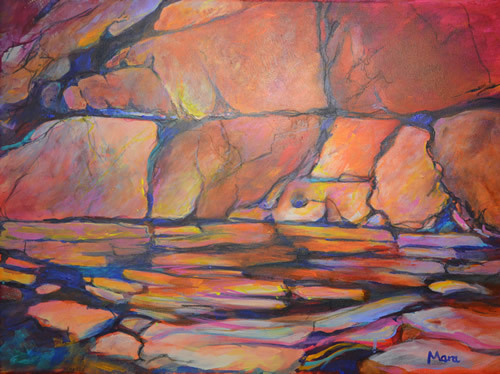 In this case, iron in the upper rocks makes them dark red – leaving the foreground blocks standing out nicely! Well, the water has come back! But you can see the rocks underneath it, can’t you? And a couple of twigs and pine needles have appeared to give a red-orange glow in places. Each new piece completed becomes my favourite, but I think this one pulls together much of what I enjoy in the others, so this is the featured image for the blog. It was recently pointed out to me that I can actually take the canvas off the supports and roll it up for travel – now, why didn’t I think of that myself? 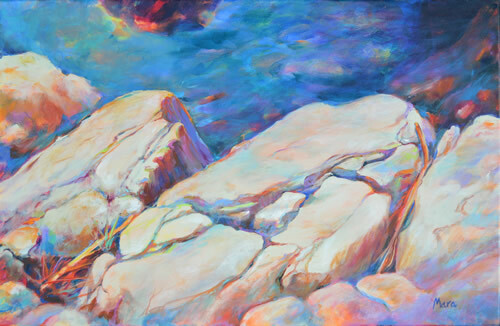 So the latest Rocks (#24) is the biggest yet, at 30″x40″! For me, that’s a big step up, not just in terms of getting paint on that acreage of canvas, but also in carrying the thing to my critique group without damaging it. Best not attempted on a windy day! 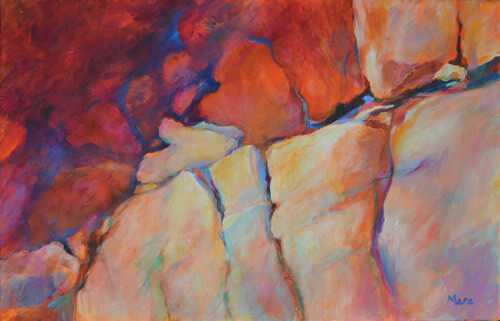 Beautiful rock paintings – love the forms, perspectives and colors. I just finished my own personal challenge on painting 15 rock/boulder studies – it was a really good exercise to go through.